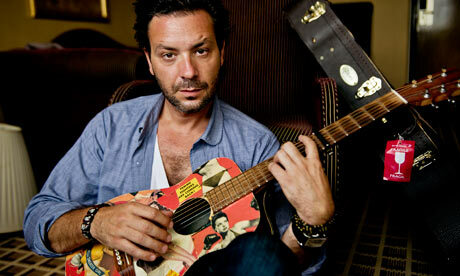 From the Voodoo Rooms Edinburgh to Byron Bay Australia, Adam Cohen begins his tour taking in 26 cities in Europe and Australia. The Voodoo Rooms is a sultry venue, intimate gigs do well here and this one was no different. Being honest, I’m not used to seated music gigs, in fact, they scare me. When the stage is jumping and the crowd are jumping we’re all in it together, but when the crowd are seated and wide-eyed with an ‘entertain me’ look about the face, well, I’m nervous for those brave souls who have taken on the challenge. Hat’s off! Adam along with his multi-talented musical entourage really did give us a charming show, though at times I felt the theatrics were unnecessary and distracting from the music, but it did seem to fit with the intermitting light hearted humour, Adam is the perfect host. Most of his latest album We Go Home was showcased. What Kind of Woman stood out for me, but Adam’s gift is in the softer songs, his diction, perfectly elegant. The single We Go Home is perhaps the most accessible tune off the album, I’ve been humming the chorus since and there is a lovely feel to it. The album was half written in his family’s house on the Greek island of Hydra and completed back home in Montreal and the single captures the feeling of return. The world needs more artists like Adam, a musician who values the subtleties of music and the reasons why we as emotional beings are intrinsically drawn towards it. And yes, the White Elephant in the room was addressed, Adam paid proud acknowledgement to his old man Leonard, in song and humour. Jokingly, Adam announced his famous Canadian parent to be none other than… “Celine”. My smitten plus one after twenty minutes whispered in amazement “Is he really Celine Dion’s son?” I thought she knew! Later a droll Scottish voice came from the back in true Burns style “Adam, you’re a star! It disnae matter who your parents are!” – And I agree. Definitely a chip off the old block, but Adam is truly a credit to himself.